Former MK Ben-Ari, members of Otzma Yehudit attacked and beaten by masked assailants while protesting in support of Elor Azariya. 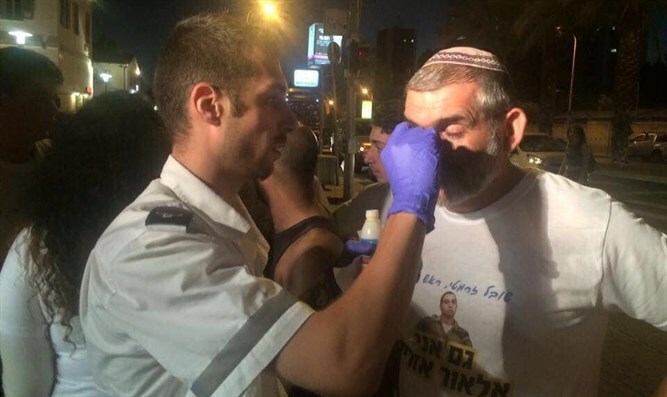 Activists from the nationalist Otzma Yehudit party were attacked on Wednesday evening during a protest march in Tel Aviv in support of IDF soldier Elor Azariya, who is on trial for shooting and killing a wounded terrorist in Hevron. During the march the youth and activists were attacked by five masked individuals who beat the participants and sprayed them with tear gas. The suspects were arrested by the police. Several youths and former MK Michael Ben-Ari, who participated in the march, were injured and required medical treatment. They were taken to the Ichilov Hospital. In response, Otzma Yehudit said that “the assault this evening of young nationalists led by Dr. Ben-Ari by leftist thugs crossed a red line and is very serious." "If it were the opposite case, all those defenders of the rule of law would have expressed their shock. We demand that the police prosecute the rioters. We will not stop to work for the release of the soldier and bullying will not win," the statement said.